During the night I slept on Antarctica wearing two pairs of socks, normal underwear, thermal underwear, water proof pants, two tops, one jumper, one Arctic jacket (with inner liner), gloves and a Peru cold weather beanie, and an inner sheet inside a -3 to -10 degree sleeping bag. It was just warm enough to not be uncomfortable although my feet where starting to get cold around 4 am. At 5.30 am on Neko Harbour we received our wake up call. After a struggle to get the rubber boats back on Ben and myself took down the tent in near record time. The penguins seemed fine but the campers were very cold. We quickly went to the landing site to wait for the zodiacs to come and pick us up. The 10 minute wait seemed like an hour during which time most feeling in my feet had gone. The warmth of the ship was welcome as was the hot shower. How explorers survive weeks camping in Antarctica I have no idea! We had two landings planned for today, Cuverville Island and Jougla Point. Unfortunately the weather was too cold and windy and the landing points too covered in snow to allow for these landings. Instead we got to enjoy the cruise and the sights from inside the ship (the decks were closed). After dinner we had a screening of ‘Happy Feet’ which maybe 40% of the passengers attended. The bad weather was a disappointment to everyone but on a day when I returned from camping I wasn’t too disappointed. Plus you have to expect this type of weather and conditions. Lets hope for better weather tomorrow. 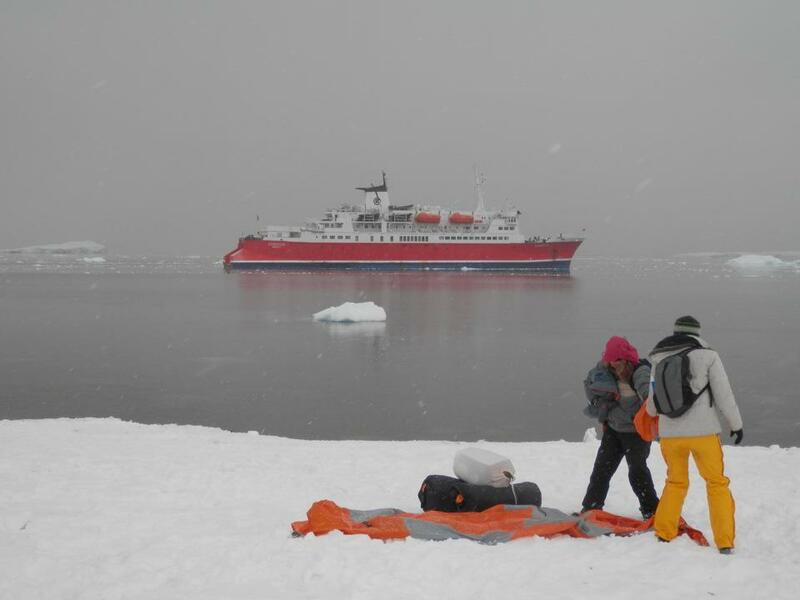 This entry was posted in World Trip 2012 and tagged Antarctica. Bookmark the permalink.